As part of the Red Bull Mind Gamers entertainment, we were taken to Locked.hu for a few warm-up escape games. In theory, we were just meant to be doing three, but we got through them, um, reasonably quickly, and so managed to fit in the full set in this venue. The staff were friendly, the facilities were reasonable and there was a bar where we could wait in between games. There’s an emphasis on solid, logical puzzles in this venue, décor that is good enough to carry the theme (although generally not stellar) and almost no story progression within the rooms. Surgery, Serial Killer and Secret Lab were all very much classic escape rooms – good back when they were first built but now a little dated. Motel and Research Base were the highlights, with tougher puzzles that better fitted their themes and a more impressive set. I played all of them as part of a very talented team of four and, with us jumping straight from room to room, we didn’t have very much time to chat through the games afterwards. These reviews are therefore very much based on my experience in the room. While I’m unlikely to have missed something very frustrating, it’s possible that there were cool things I did miss out on. First impressions were of a tired operating room which, given the theme, is probably reasonable. While it wasn’t enough to impress me, it equally didn’t distract me from the game by being weak. What did draw me in was the way the room was laid out. It very much had a set of “stations” around the space, so the team could easily split up and start investigating separate things. There’s not much in the way of searching to be done, so we were trying to get a handle on what the puzzles were and which ones were available to us. They were all pretty standard fare but with logical solutions, so we zoomed through them in pretty short order. In fact, we finished in under twenty minutes of which almost half was spent solving the final puzzle. In spite of being disappointingly simple, in a room with no story beyond the intro and relatively little by way of reveals, this final puzzle did have the pleasing effect of tying the room together nicely. While it didn’t truly have the feel of a finale, it generated plenty of team discussion and a good “aha” moment. Bedrooms aren’t a particularly uncommon theme for an escape game, but this was by far and away the best I’d come across. When you walked in, it genuinely felt like you were entering a motel, and pretty much everything you could think of in that environment was there. I desperately want to tell you about all the little touches they’d put in to aid the immersion, but part of the surprise of the room is experiencing that for yourself, so I’ll leave it there. In fact, another reason I can’t tell you about these little touches is because so many of them formed part of the puzzle set. They’d put a considerable amount of effort into creating puzzles that could only fit in this room. Many games I’ve played have puzzles that could with almost no effort be transported to an entirely different theme and, while that isn’t necessarily terrible, there’s something enjoyable about knowing that a particular puzzle was made for that particular game (plus, it usually signals that they’re a little more original). Surprisingly for a motel room, there’s a decent sense of exploration. I think that was helped by not having high expectations given the subject matter, but it still managed to surprise me once or twice. You won’t have to do a huge amount of searching along the way, so you really can focus on experiencing the surroundings. There’s a fair number of puzzles to get through, and sometimes it really wasn’t clear where to go next to continue so, if you’re playing in a small team, I’d recommend taking clues to progress if you’re not sure what you should be doing. Having said that, the puzzles were generally very fair. The one exception to that was one, near the end, that seemed to be slightly destructible. You could counter that weakness by brute-forcing the solution slightly, so it didn’t actually hurt the game too badly, but it was still a little bit of an uncomfortable way to end what was otherwise a good game. 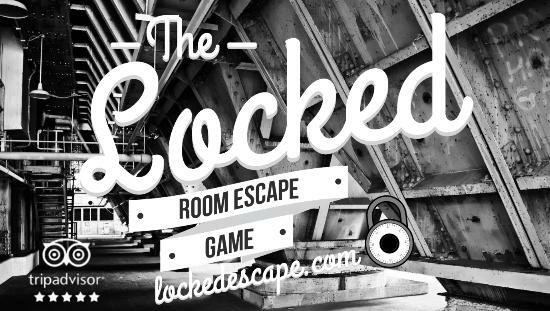 Note – there are two Serial Killer games at locked.hu. This is the older one and was voted the best game in Hungary in 2014. Ahhh, dimly lit rooms, how I hate thee. This was one of those games which add difficulty by reducing the brightness levels. In their defence, I think the intention was partly to get across a night scene and the slight spookiness that entails, but for me it detracted significantly from the experience. That’s a shame because, from what I could see, they’d made a decent amount of effort to get the scene across – the soft crunch of gravel underfoot was just one example of where they’d done better than the average company. The early puzzles here don’t particularly hang together or do more than pay lip service to the theme. Don’t get me wrong – they were fun – but they were abstract puzzles forced into an escape room. In spite of that, I was impressed by one physical puzzle early on in the room which had a novel mechanic. In contrast, a physical communication-based puzzle later on was tough to use and heavily penalised players for any mistakes. It felt like a love-it-or-loathe-it puzzle, especially since it’s a bottleneck, which means you’re likely to be stressed from the entire team watching. They’ve also included a bit of technology in the room which, while potentially cool for first-timers, just felt like an unnecessary source of frustration to me. It was clumsy to use and, without being able to properly test out how it worked, we just had to hope for the best. Secret Lab was a strange game, with a setting and puzzles that really didn’t work for me. I guess the clue is in the name – it’s a secret lab – so the start of the game could be pretty much anything, and at some point you’ll find some sort of laboratory. That transition jarred for me, though, and I can’t really explain why. It wasn’t helped by the themes not being particularly strong – the first impression, in particular, is of a pretty dull room. Perhaps it was the combination of the set and the puzzles that left me wanting more. I want to say that the puzzles were just standard escape room tropes, but that isn’t quite right – there were original touches. The problem was that these didn’t make the challenge more enjoyable and instead left me feeling like the puzzles didn’t make as much sense. They’d clearly made an effort, too – there was a potentially fun two-player example which was ruined by either a poor implementation or a gradual degradation that had left a truly ambiguous solution requiring us to brute-force our way through several options in a combination lock. While some of the puzzles in the room undoubtedly fitted the theme, several (probably most) of them could have been in pretty much any game. On another day, I might have enjoyed the finale to this game, but we were frustrated by finding a viable – but incorrect – alternative solution to the end puzzle. Having multiple valid solutions isn’t exactly desirable, but it’s not the end of the world – it just means you have to keep persevering and may get a little frustrated when your seemingly valid answer is rejected. This was exacerbated here by the fact our version of the solution made it easy to make a mistake, especially with the way the puzzles were constructed, so we spent quite a lot of time rechecking our answer. Even that might have been OK had it not been for their attempt to prevent brute-forcing of the solution by limiting players to three attempts before failing the room. To my mind, if you’re going to have such a draconian ending, you need to be absolutely certain that there’s only one possible answer. In my opinion, Research Base was the best of the Locked.hu rooms. As soon as we walked through the door, we could feel that it was just a cut above everything else on offer. It gave off vibes of some sort of sciencey/computery base, and the grey/metallic colouring used throughout the game fitted with the Siberian theme. When you think of the very best set designs, there’s an attention to detail that really carries you through, but this took an alternative approach of having a very clear feel and just implementing that across the entire space. That wouldn’t have worked without a few interesting set pieces, but it really showed me that you can produce something pretty immersive without having to design every last inch in detail. Throughout the game, there’s a fairly clear mission that you’re trying to break into the base and steal a particular valuable item. There’s a real sense of progress as you transition through the stages and slowly move towards your goal. I particularly liked that you’re able to see your objective before it’s actually reachable which, for me, ratcheted up the excitement. There was a fun set of puzzles to complete along the way that pushed us to our limits. Some were reasonably straightforward, but something I really enjoyed was the number of times that the team were discussing potential solutions and producing ideas that I don’t think we would have come up with individually. Simpler puzzles or puzzles with leaps of logic rarely get that kind of teamwork, so it’s testament to a solid room that they occurred several times.